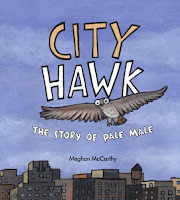 CITY HAWK: THE STORY OF PALE MALE by Megan McCarthy (Simon & Schuster), straightforwardly told for primary audiences, and who can resist those big googly-eyes that are a signature of McCarthy's illustration? 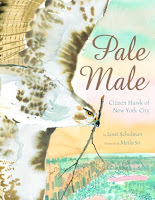 (4 and up) And then there is the more detailed PALE MALE: CITIZEN HAWK OF NEW YORK CITY by Janet Schulman, illustrated in how-does-she-do-it gorgeous watercolor and colored pencil by the inimitable Meilo So. 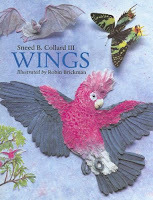 (6 and up) Teachers, Read them both and compare the treatment of the same subject by different authors and illustrators! Hmmm, I don't know if I could afford to spend more on a bird's house than I spend on my own, but doesn't this prime real estate (above) from Uncommon Goods inspire the crafter in you? As does the "Fairy Tale Dreamcatcher" from OneGoodBumblebee (this would make a fun classroom activity, or Mother's Day gift for kids to make!) and the obscenely priced Songbird Chandelier from Anthropologie? They sell those little felt birdies and flowers at Michael's, people. Sorry to derail the consumer love train, there, but after all, DIY is the new Nordstrom's, dahhhling! 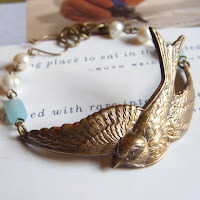 On that note, I love my soaring bird bracelet I got at Erm Originals on Etsy, it goes with everything. She's always got lots of lovely wing-themed jewelry, and in the spirit of the birds, her pieces are are cheep, cheep! 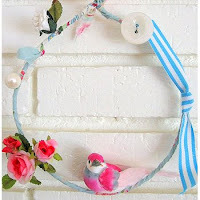 Also on the subject of crafting and birds, take cyber-wing to The Crafty Crow, an egg-ceptional blog featuring kid-friendly art-and-craft inspirations and plenty of pix! I know you will want to bookmark this fabulous resource to visit again and again! Happy Earth Day, and happy robin-sightings, everyone! When Queen Isabella wasn't impressed by the gift of a sweet potato, Columbus told a teeny weeny little white lie about the new world being littered with gold and gems. This caused a rebellion and landed big C. in leg irons. But perhaps Isabella shouldn't have been so quick to judge the shortcomings of others, seeing that she boasted only two baths a year. Grace O'Malley marauded English ships for sixty years...who would suspect such a sweet little old grandma of being a pirate? Bad, bad Babe Ruth hung his baseball manager out of the window of a moving train. Bach hit a bassoonist with a stick after names could never hurt him, and Daumier painted the king of France as a pear, a leap of comedic faith that went highly unappreciated by the noblesse oblige. From Cleopatra to Rosa Parks, over a dozen famous figures who crossed the line in their time are given tongue-in-cheek due, accented by extra-pouty double-page cartoon portraits. 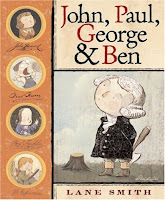 This very light bite of history and will appeal to the irreverent tastes of those who enjoy Lane Smith (JOHN, PAUL, GEORGE AND BEN) and Jon Sciezka (TIME WARP TRIO). For older children, this is a great springboard into deeper exploration, and older kids can make reports of troublemakers of the 21st Century (there have been a few). 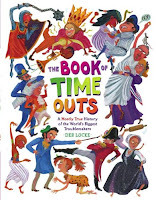 Teachers, read it in combination with books like Mordicai Gerstein's THE MAN WHO WALKED BETWEEN THE TOWERS and Don Brown's KID BLINK BEATS THE WORLD to discuss the difference between civil disobedience and good ol' fashioned bad behavior. Almost everyone thought they didn't deserve a time-out. A few were right. The one thing we can know for sure is that someday, somewhere, someone will once again be badly behaved, out of order,ill-mannered, inappropriate, or just plain unwilling to follow the rules. And they'll need a time out. Let's just hope that someone isn't you or me. At these words, whoever was lucky enough to be wearing scales jumped, gulped, and carried off Thumbelina, saving her from the lovesick animals, a true peril. For if one love is worth a hundred dangers, the worst of dangers is to accumulate one thousand loves. 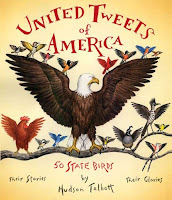 Just in time for National Poetry Month we have this new offering by the same illustrator, who is one to watch; at this rate, I think he is worthy of Hans Christian Andersen Award consideration down the pike. "Mommy, my fish is going to die! Come quickly! Leon is going to die of boredom!" Arthur's mommy looks at him. "Hurry, give him a poem!" And she leaves for her tuba lesson. But what is a poem? Is it the heartbeat in a stone, or when words beat their wings against the bars of a cage, or words turned, like an old sweater, backwards and inside out? 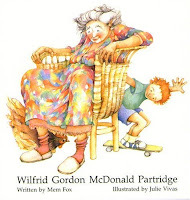 Arthur rummages under the bed and in cupboards, interviews neighbors and grandparents, and by and by connects the cryptic quips and voices to create (what else?) a lovely poem out of the small and merry and honest things in his world. With illustrated flights of the imagination such as cresent moons hanging like fruit from the sky and palm trees growing upside-down, oh-la-la, that fish won't be bored for long. Funny and provocative, every teacher (and author!) 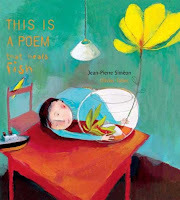 needs to share this book to springboard into the conversation of what makes a poem...and where do we find our own? 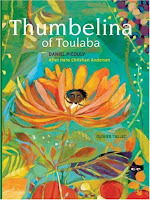 In honor of the trippy horticulture in Thumbelina of Toulaba, plant something besides the seed to read! Every season I plant these Renee's Garden "Magic Beanstalk" beans (scarlet runner beans) in my city-girl community garden. Their winding vines grow long and have pretty red blooms, but best of all, the seed pods contain beans that are the craziest un-bean-like fuchsia color. Open them up in front of children to hear them go "ooooo!" and believe that there just must still just possibly be some magic left in the world. I understand you can cook and eat them, but I never have; I just dry them until they turn their curious purple, and then they are just right for sharing with other storybook gardeners. 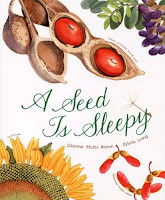 Who says a seed is sleepy (besides author Dianna Aston)? 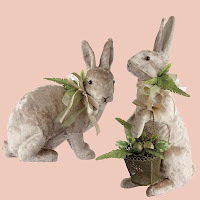 Also hope to meet up with these Velveteen Rabbits from the Victorian Trading Company, finally on sale aprés Easter but still spring-y. I'm afraid these will be the only bunnies welcome in my garden! So I say, "I'm not Roy,"
and she answers, "You're not?" Then I tell her, "I'm Tom. 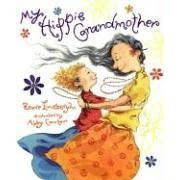 It is sometimes worrisome for children and their families when grandparents call them by the wrong name, but here is a book that deals with issues of impending senility and Alzheimer's in a way that readers will recognize. 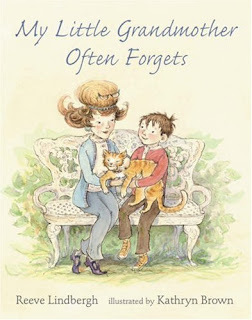 Rather than heavy-handed bibliotherapy, My Little Grandmother reads like a friendship story between a patient little boy and and older family member. 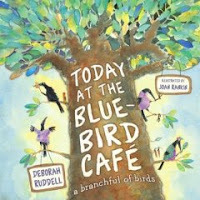 Behaviors like repetitions in conversation, periods of quiet, and issues of safety all receive a blessedly light and age-appropriate touch through well-paced verse and cheerful watercolor and ink illustrations. The dearness of the aging person is never undermined, nor is the helpful role of the child. Congratulations to SHEILA, who posted her favorite picks of 2007, for winning the drawing for a copy of the VIVE LA PARIS audiobook! Sheila, your post didn't include your address or contact 4-1-1, so shoot me a comment with that info (won't be posted publicly) and I'll get it in the mail to you this weekend! Thanks to all who participated and shared. Happy Poetry Month! Check out the PlanetEsme Poetry Power page, and check back through the month for the latest picks. This post is dedicated with love to Rosalie Codell, my sparkly and glamorous grandmother who sometimes forgot, but who won't be soon forgotten. August 6, 1921 - March 27, 2008.